There is, naturally enough, plenty of excitement concerning the next installment of Mass Effect, which comes out in a couple of weeks. 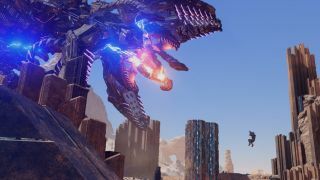 Those intending to play on the PC will be pleased to hear some fresh, juicy details regarding the graphics settings, along with the release of some impressive new 4K resolution grabs. This little lot of Mass Effect: Andromeda screens in 4K, courtesy of Nvidia, features every detail slider set to maximum (click on an image to expand it to full-size). There are 16 graphics settings you can adjust in total, and they are as follows (deep breath): Ambient Occlusion, Anti-Aliasing, Chromatic Aberration, Effects Quality, Film Grain, Lighting Quality, Mesh Quality, Post-Process Effect Quality, Resolution Scaling, Shader Quality, Shadow Quality, Terrain Quality, Texture Filtering Quality, Texture Quality and Vegetation Quality. As mentioned, they are all cranked to maximum in these images. HDR can also be enabled for those who have a display which supports it. Nvidia also went back over the official PC hardware specs for Andromeda. The minimum spec (for 720p resolution) requires an Intel Core i5-3570 or AMD FX 6350 processor alongside 8GB of system RAM, and a GeForce GTX 660 graphics card (or Radeon 7850). As for the recommended spec (for 1080p play), that insists on an Intel Core i7-4790 or AMD FX 8350 processor, 16GB of system RAM, and at least a GeForce GTX 1060 3GB or GeForce GTX 970 (or RX 480 on the AMD side). The company doesn’t specify what’s required for a smooth 4K gaming experience, but you can bet you’ll need a beefy processor (perhaps even a new Ryzen 7 1800X) and graphics card. Nvidia does state that those who want to max out all the detail levels will need a ‘faster GPU’, meaning at least a GTX 1070 or 1080, or the freshly revealed GTX 1080 Ti (doubtless the latter if you’re looking at fluid 4K gaming). Mass Effect: Andromeda goes on general sale on March 21 in the US, and March 23 in Europe (although it will be available earlier for EA’s Origin Access subscribers – on March 16, in fact). Could Andromeda join the ranks of the best PC games known to man?